Our vetty bean doesn't make us get all the shots if mom doesn't want us to. So we only get rabies wich is good becos even tho you aren't an owtside kitty, you mite skape sometime and be lost (like Luna) and then you wood be glad you had it. And some kitty camps won't let you stay there if you don't have the shots. Yore mom cood call the vetty office and aks befor she takes you there and then call other vetty offices and find one who agrees wif her. yep, our mommy talked wif our v-e-t about it, and he saided that since we is only inside kitties and nefurr go out ('acause we is afraid of the outside) we doesn't haf to get all the shots. we do get the rabies shots though, just in case like Finny and Buddy saided. the v-e-t also said that indoor kitties, if they want the shots, do not need to gets them efurry year, but they should get them efurry 2-3 years if they is gonna gets them. Trixie and Norton nefurr hadded any more shots after their 1st year roosters, and they lived to be 18 and were furry furry healthy kitties. Mommy got us our first shots and will get us our 1 year roosters, but is doing minimal vaccinations after that. Vincent was furry brave and went through lots of surgeries & radiation w/o complaining, but she doesn't want us to ever have to go through that. By the way, radiation & surgery is just as effective as amputation. It costs a lot more, but Vincent would tell you that quality of life is more important - he didn't die of cancer and he could do stairs until the day he went to the Bridge. I very much much much understand your fear. I had a femur infection last spring which my Meowmy attributes to my rabies shot. No of the VET's figured out how my bone actually became infected but Meowmy thinks its from the shot somehow. Our VET does not vaccinate that much. We get "titers" of our blood levels that contain the antibodies. After one set as kittens of FVCRP we are pretty much covered for life. Have your bean talk with the vet and look around at different vets in the area. Over vaccinating is NOT a good thing at all. Meowmy is terrified of my rabies shot this year!!! We tolds our VET last time we had to have our shots dat we only wanted the rabies one. They didn't argue with us at all. They told us about the reasons they felt the other ones were needed but we just stuck with the rabies. They also only give us vaccinations in the back left thigh I think. We don't always take them right in to get their rabies because we have read it is really a shot that stays active for 2 to 3 years, sometimes more. The only thing is it is a state law, so we feel we must do it. Since we all indoor kitties we aren't worried about the other shots. that's one big beautiful fluff boy! we're all only 1 1/2 an we had whateffur shots ya had ta haf when we got ::shudder:: "fixed", but we hasn't had any since then (it's been almost a year now). we neffur go outside an our Lady's effun scared ta take us from the house ta the car in a carrier because we're not supposed ta be living here an she duzzn't want anyone ta know. that means we prolly won't be seeing a vet any time soon, but she's not shure if what she should do or shouldn't do eiffur. alls i gotta say is DON'T TAKE MY PURRTY ANGIE TA THE HORRYBULL STABBY PLACE! Wow! That is terrible that Tiger crossed the bridge cause of something that was supposed to be good for him. Meowm doesn't know anything about this, but it looks like some others did. Meowm has told me that she will be extra careful of what shots I get. I gotta get that FVRCP shot, the kittie spa requires it for any kittie coming to stay. Mum can't remember exactly where they gave it to me however. Gotta remember that. If I didn't go to the kittie spa I wouldn't have to get it. Then mum would only have me get rabies shot, just in case I bitey someone bad. We're sorry about sweet Tiger. I didn't haf to get that shot, probably because I never go to a spa like Derby and I'm inside. I only gets my rabies and FLV. Mommy says you haf to have a vet you're comfy with and who won't do anything you aren't comfortable with. Just like a bean doctor, she has to feel good about the vet. There is one vet in the group I go to (I usually see the nice lady but it was an emergency) that my mommy will never take me back to and she told him so. He wanted to to a bunch of stuff I didn't need. The nice lady vet and the nice man vet I've seen a couple of times (he took care of mom's woofies who went to over the bridge) said no way I needed that other stuff! At my last checkup, my vet suggested skipping one of the "standard" shots to reduce the chance of the vaccine causing cancer... as long as I'm not going outside at all, she (vet) felt the risk outweighs the benefits! As ofurs said, ask yur vet, ask ofur vets, an check wif any "cat hotels" you might take yur furbabies to. I much purrfur to stay home an attack a cat sitter myself. Cept the girl across the street - she's okay by me. We're furry sorry bout Tiger. 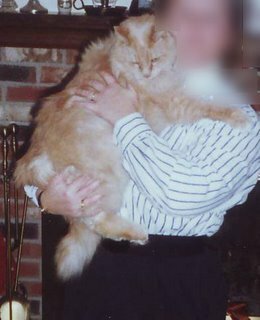 Scruffy, the cat afore me, died of tumors in 1996, at 12 years. No treatment was suggested, but she lasted almost 6 months, then suddenly it was time an Mom had to take her to the VET for help goin to the bridge. No idea if it was from the vaccine. OMG, I never knew this! It's law here too but the city outsorced the recordkeeping to an out-of-state company and they're pretty dumb. I have to have them because they know about me, but the weird thing is that both my sisters came from the city shelter and I think that stupid company only knows about Olivia. And they think her vaccine is good until 2030! Anyway, Eddie has never been shot and our wonderful vet won't make him get shot, which is good. I'm going to let my mom know about this danger because I have to get shot soon (:::scowl:::). We don't mind getting our licenses even if we still can't drive, but Mom hates the whole rabies shot business. And like you said, we don't go out either so it's really dumb. PLUS, my mom rarely bites us so I'm pretty sure we're safe. Hello, I am new on the blog and I did read your problem. I can amagine you are scared, and you should be. Tumors in the neck is something that pops up the last few years. All the VET's know this problem. After the vaccination the Vet should rub the place so the liquid can not concentrate there. But.....tumors are the result of vaccinating each year. And vaccinating each year is NOT nessecary. You are not comitted to vaccinate your cat (rabies is different). You can, and may, and should refuse. Vaccinations once in the three years is enough. It lasts so long. Iff you want to know more about it, you are free to cantact me by e-mail. Momma decided to have us get all our shots when we first came to live with her. So all three of us inside kitties have been gotten our shots.......BUT.......Momma says no more......we are inside all the time and we are all healthy and have been tested for everything. So the answer is, NO MORE SHOTS for us indoor kitties. When I got one of my shots, I had a lump for a long time, that really worried Momma. What a beautiful big floofy boy Tiger was, a bit like me really! I am sorry to hear about what happened to him. I think injections are slightly different here in the UK, like Eric and Flynn said. I do have my booster shot once a year which is for cat flu and so on. I have to have it because I can't go to the kitty jail/holiday camp unless I am up to date on it. I have never had any lumps after my booster shot, which is good. Cats here never have rabies injections because there isn't any rabies in the UK. I am glad about that!!! I suppose if a kitty was emigrating to the USA it might have to have it. My sister Hattie died of cancer but I don't think it had anything to do with injections, her tumours were in her abdomen. Hopefully your v-e-t will be helpful and you can talk with them and decide what to do. Awww, so sorry to hear abowt what happened to Tiger! We don't haff rabies here in Ha-why-ee so we don't need to be poked fur this. Momma let the v.e.t. giff me shots when I had my hoo-ha-ectomy in April and the same fing happened to Tiger when he had his operashun. But Blackie and Bebe neffer go in fur rooster shots since Momma don't fink we need it since we neffer go owtside and Tiger neffer went back too. She sed I don't need to go back ether. Beau Beau, Angie - we're back online! Mum is feeling better. Aw, poor Tiger. He looks a bit like me, don't he?? Mmm - me and pandy haff all our shots. It's the law here, although we don't haff to haff the rabees shot. Mum is more worried about infekshun wiff our chips than our shots. First off I'm really sorry to hear about Tiger. He was a beautiful cat. I know how much it hurts to loose a beloved pet as I am sure everyone here has experienced who are commenting. This has been very enlightening to me I have never heard of a vaccination causing cancer. All these comments have been very interesting. I have gotten my cats their first shots but never any afterwards. They are inside cats also. I have visited so many cat sites and read books on cats but I am sure it was in a book that I read recently that inside felines do not need shots and are healthier if they don't get them all the time. Outside cats do need them. Sorry, but it seems like you might want to change vets. duz you like my Midnight Monday picshure? Thanks efurryone for your advice and information about the vaccinations. Mom says we will not be getting anything cept the rabies shot coz we has to then not for three years.